This 2-storey Italianate is typical of the genre (see South Turner and Amelia Sts) and is almost identical to 619 Avalon and 648 & 652 Niagara (all 1891, in James Bay). (The porch here is misleading as it has been carried round the corner as a verandah, in a sympathetic 1979 renovation, at the same time as an extensive rear addition.) The form is a basic cube, with a box bay on one side, and a decorated front façade. A 2-storey octagonal bay on the front left has a hipped roof, a pent roof, and brackets, and some of these elements are carried on to the simple front porch. The wealth of decorative features includes sandwich brackets on both levels, chamfered posts with cutout brackets, and a door assembly with sidelights and transom. This was the Vyes’ second house on the property. The first, in brick, was demolished. Alexander (1843-1933) and Margaret Jane (MacDonald, 1853-1932) Vye came from New Brunswick in 1883. They purchased their farm, originally owned by Bishop Modeste Demers, in 1884. The Vyes owned all the land from Shelbourne Av to Foul Bay Rd, which they operated as Richmond Farm, a dairy and potato farm. Alexander invested in real estate, including land in the Fraser Valley - there’s a Vye Rd in Abbotsford. He also owned the Montreal Clothing House on Government St in the mid-1890s. The Vyes had four sons and one daughter. Son James became a doctor (1790 Carrick). Daughter Ella Gertrude Vye (1892-1974) married Hugo Howard Allen (1892-1979) in 1917 at this house, and they remained in this house after her parents died in the 1930s. Hugo was a civil engineer, and a founding member of the Gorge Vale Golf Club. 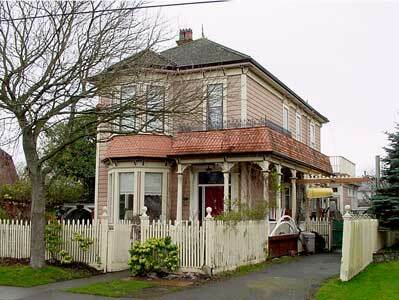 The house remained in the family until the deaths of Ella and Hugo in the 1970s. Vye relatives owned several other homes on the property, including two at 2536 Richmond Rd and 1846 Kings Rd, all still standing. Patrick and Suzanne Bulmer won a 1985 Hallmark Society Award for their restoration of this house.